RC Industrial was able to provide a major customer with a viable solution to an ergonomic issue. Plant workers had to push and pull a 2,089 lb cart during their manufacturing process. The force required to move the cart had to be reduced significantly. 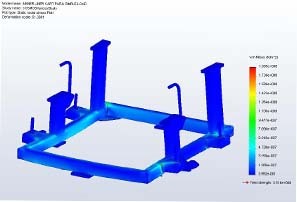 By generating a 3D solid model of the cart RC industrial was able to remove areas of the cart frame, then model the stresses and verify that the cart was still strong enough for it�s intended use. 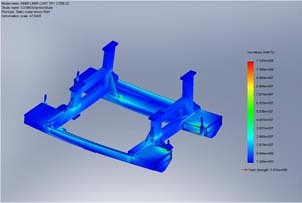 RC industrial was able to reduce the cart weight by 35%! RC industrial generated an eight page report describing the different options for the customer, including making the cart from scratch, changing to a different caster design, and included costing for each option. © Copyright 2019 - RC Industrial Services Inc.